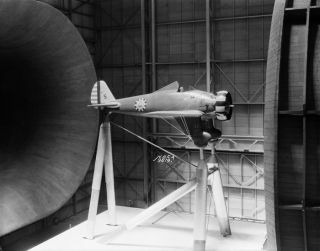 The Boeing P-26A, also called the Peashooter, is mounted in the 30 x 60 Full Scale Tunnel in 1934. In this historical photo from the U.S. space agency, the Boeing P-26A fighter is mounted in the 30 x 60 Full Scale Tunnel in 1934. Nicknamed the "Peashooter," it was the first Army fighter to be constructed entirely of metal and to employ the low-wing monoplane configuration. The wings, though, were externally braced, and the landing gear was fixed. The Peashooter was also used during a measurement of pilot's field of view.